Corporate executives and university presidents are, yet again, calling for public discussion on race and racial inequality. Revelations about the tech industry’s diversity problem have company officials convening panels on workplace barriers, and, at the University of Oklahoma spokespeople and students are organizing town-hall sessions in response to a fraternity’s racist chant. The most provocative of the efforts was Starbucks’ failed Race Together program. In March, the company announced that it would ask baristas to initiate dialogues with customers about America’s most vexing dilemma. Although public outcry shut down those conversations before they even got to “Hello,” Starbucks said it would nonetheless carry on Race Together with forums and special USA Today discussion guides. As someone who has done sociological research on diversity initiatives for the past 15 years, I was intrigued. What would conversations about race have looked like if they played out as Starbucks imagined, given the social science of race? Can companies, in Starbucks’ CEO Howard Schultz’s words, “create a more empathetic and inclusive society—one conversation at a time”? A data-driven autopsy of Starbucks’ ambitions is in order. Surprisingly, Starbucks turned its sights on the provocative issue of racial inequality—not just feel-good cultural differences (or, thank goodness, the sort of “respectability politics” that, under well-intentioned cover, focus on the moral flaws of black people). Most Americans, especially those of us who are white, are ill-informed on the topic of inequality. We generally do not recognize our personal prejudice. We routinely, and incorrectly, insist that we are colorblind and that racism is a thing of the past, as sociologist Eduardo Bonilla-Silva has documented. When we do try to talk about race, we usually resort to what sociologists Joyce Bell and Doug Hartmann call the “happy talk” of diversity, without a language for discussing who comes out ahead and who gets pushed behind. Perhaps this was a promising starting point. Americans prefer psychological explanations; we like to think that terrorism, poverty, obesity, and other social ills are rooted in the individual’s psyche. We also do not want to see ourselves as complicit in the segregation of our communities, workplaces, or friendships. We definitely don’t want the stigma of being “racist.” Even white supremacists resist that label. So if it’s true that we can’t see our own bias, as Starbucks told us, we can take comfort in our innocence. Starbucks’ description of the bias experiment actually took the conversation where it never seems to venture: to the advantages that white people enjoy. White people get help, forgiveness, and the inside track far more often than do people of color. But Starbucks stopped before pointing the finger at who gives white people these advantages. The rest of Race Together veered off in a confused direction, mostly bent on educated enlightenment. The conversation guide was a mishmash of racial utopianism (the millennials have it figured out! ), demography as destiny (immigration changes everything! ), triumph over a troublesome past (progress! ), testimonies by people of color (the one white guy is clueless! ), statistics, inspired introspection, and social network tallies (“I have ____ friends of a different race”!). Companies have been trying to positively address race for decades. Typically, they do so through diversity management within their own workforce. Their stated purpose is to increase the numbers of people of color in the top ranks or improve the corporate culture. Most diversity management strategies, however, are far from effective (unless they make someone responsible for results), as shown by as sociologists Alexandra Kalev, Frank Dobbin, and Erin Kelly. Corporate aggrandizement and the façade of legal compliance seem as much the goals as actual change. Race Together most closely resembled diversity training, which tries to undo managerial stereotyping through educational exchange, but this time the exchange was between capitalists and consumers. And it bucked the typical managerial spin. Usually, the kicker is the business case for diversity: this will boost productivity and profits. Instead, Starbucks made the diversity case for business. Consumption, supposedly, would create inclusion and equity. That would be its own reward. There was no clear connection to its specific business goals, beyond (disgruntled) buzz about the brand. What were you thinking, Howard Schultz? Briefly, let’s revisit what made Starbucks’ over-the-counter conversations so offensive. Starbucks was asking low-wage, young, disproportionately minority workers to prompt meaningful exchanges about race with uncaffeinated, mostly white and affluent customers. Even under the best of circumstances, diversity dialogues tend to put the burden of explaining racism on people of color. Here, baristas were supposed to walk the third rail during the morning rush hour without specialized training, much less extra compensation. One sociological term for this is Arlie Hochschild‘s “emotional labor.” The employee was required to tactfully manage customers’ feelings. The most likely reaction from coffee drinkers? Microaggressions of avoidance, denial, and eye-rolling. Swiftly, the company came out with public statements that had the air of faux intention and cover-up, as if to say, “We’re not retreating; we’re merely advancing in the other direction.” Starbucks had promised a year of Race Together, but the collapse of the café stunt made an all-out retreat more likely: one more forum, one more ad, then silence. Race Together trod treacherous ground. The research shows that diversity training backfires when it attempts to ferret out prejudice. It puts white people on the defensive and creates a backlash against people of color. For committed consumers, Starbucks was messing with the equivocally best part about capitalism: that you can give someone money and they give you a thing. For activists, this all smelled wrong (i.e., not how you want your latté). Like co-opted social justice. … Does anyone in HQ ever ask what works? Starbucks was wise to shift closer to the traditional role of a coffee house—the so-called Third Place between work and home that Schultz has long exalted. Hopefully, the company looks to proven models for productive conversations on race. Organizations such as the Center for Racial Justice Innovation push forward discussions that recognize racism as systemic, not as isolated individual attitudes and bad behaviors. This helps to avoid what people hate most about diversity trainings: forced discourse about superficial differences (“are you a daytime or nighttime person?”) and the wretched hunt for guilty bad guys. According to social psychologists, unconscious bias can be minimized when people have positive incentives for interpersonal, cross-racial relationships. Wearing a sports jersey for the same team is impressively effective for getting white people to cooperate with African Americans, as shown in a study led by psychologist Jason Nier. The idea is to not provoke white people’s fear and avoidance of doing wrong. It is to motivate people to try to do what’s right by establishing a shared identity. 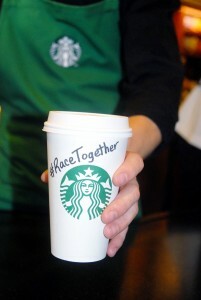 Starbucks also needs to wrestle with its goal of “together.” That’s not always the outcome of conversations about race. Political scientist Katherine Cramer Walsh found that participants in civic dialogues on race commonly walk away with a heightened awareness of their differences, not with the unity that meeting organizers hope to foster. Is it better to abandon ship? Despite its missteps, Starbucks, in fact, alit on hopeful insights. Individuals can ignite change, and empathy and listening are starting points. The company deserves some applause for taking the risk and for its deliberate focus on inequality. Undoubtedly, working-class, minority millennials could teach the rest of the country something about race (and executives something about company policy). But let’s be clear about what Race Together was not. It was not about addressing institutional discrimination. In that scenario, Starbucks would have issued a press release about eliminating patterns of unfair hiring and firing. It would have overhauled a corporate division of labor that channels racial minorities into lower-tier, nonunionized jobs. It might very well have closed stores in gentrifying neighborhoods. Those solutions start with incisive diagnosis, not personal reflection. (The U.S. Department of Justice did just that when it scrutinized racial profiling in traffic stops and court fines in Ferguson, Missouri.) Those solutions require change in corporate policy. To make Race Together honest, Starbucks needed to recognize an ugly truth: America’s race problem is not an inability to talk. It is a failure to rectify the unfair disadvantages hoisted on people of color and the unearned privileges that white people enjoy. Corporations, in their internal operations, are complicit in these very dynamics. So, too, are long-standing government policies, such as tax deductions of home mortgage interest (white folks are far more likely to own their homes). And white Americans may not want to hear it, but racial inequality is, in large measure, rooted in our collective choices: where we’ll pay property taxes, who we’ll tell about a job lead, what we’ll deem criminal, and even when we’ll smile or scowl. Howard Schultz, are you listening? Ellen Berrey is in the department of sociology at the University of Buffalo, SUNY and affiliated scholar of the American Bar Foundation. Her book, The Enigma of Diversity: The Language of Race and the Limits of Racial Justice, will be out in April 2015. Cross posted at The Society Pages.